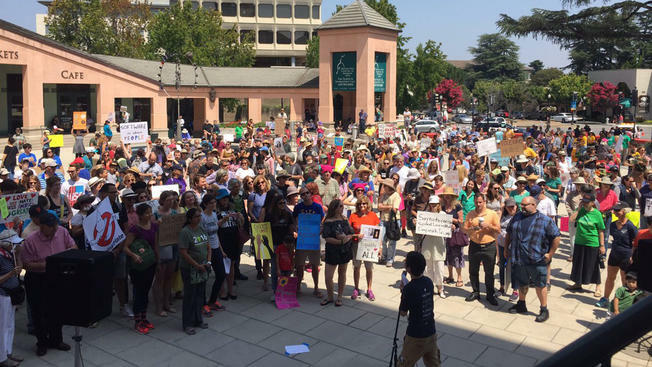 Hundreds of people flocked to Mountain View’s City Hall on Saturday, standing up against hatred, sexism and a white nationalist movement that has dominated headlines since last week’s deadly riot in Charlottesville. Originally, the Stand Up for Equality and Diversity Rally, which lasted from 1 to 3 p.m., was meant to counter an “alt-right” protest called March on Google to Charleston Park. Concerns about violence also forced the Make-a-Wish Foundation to nix its charity walk, originally scheduled for Saturday. Even so, the counter-protesters decided to forge ahead with their rally. "I don’t support violence, and I certainly don’t support terrorism and people marching around with tiki torches," protester Elizabeth Beheler said. "So yes, I think that I am a suburban soccer mom here peacefully expressing myself." Protester Natalia Price said part of her attendance at the rally was to challenge President Donald Trump's response to the violence in Charlottesville. She said her family came to the United States to experience love, respect and diversity, but she finds that the current administration is not upholding those values. "He keeps supporting things that are just completely counter to that," Price said. "And I think the American people want to stand up and say, 'This is enough. We’re done with it.'" Among a slew of speakers, Mountain View Mayor Ken Rosenberg told the 400-strong crowd that he planned to go to Charleston Park himself and stare down neo-Nazis and people who promote fascism under the cloak of free speech.